Perry Mason suborning perjury? Never! Except this once, sort of. This episode is a rare bird indeed, and the only time you�ll see double when you see Burr. Raymond Burr appears in his regular role as Perry, and also plays Mr. Grimes, a drunk, a troublemaker, and the spitting image of Perry Mason. The �Mr. Grimes� role is a lot closer to the characters Burr was used to playing before he came to the Mason series. Perry finds himself on the losing end of a patent dispute case when his opposition leads the jury to believe that Mason paid a witness to change his testimony. How could this have happened? A cockney merchant seaman named Grimes is a dead ringer for the noted attorney. With a little makeup and some coaching, Grimes merely impersonated Perry and passed an envelope full of money to a key witness. The civil case turns into a criminal one when the winning party in the patent dispute is murdered. The number one suspect is Perry�s client, Barbara Kramer, but the lawyer thinks the murderer may be someone a lot closer to home. Roland La Starza made for a convincing bouncer in this episode. He was a former boxer, a heavyweight contender who challenged Rocky Marciano twice during his career. The first fight in 1950 lead to a controversial loss. The second was in 1953 for the heavyweight title and La Starza was knocked out in the 11th round. After retiring in 1961, he parlayed his fame along with his good looks for small TV roles. Submitted by Kenmore, 5/20/2010. Sightings: The Pencil Mustache Man can be seen in the courtroom, middle row sitting behind the defense side. Also, it appears the Quiet Old Man is sitting in the last row, defense side & two seats closer to the door than the Pencil Mustache Man. Submitted by Kenmore, 9/24/2010. Read more about these and other regulars here. Submitted by gracenote, 6/8/2011. Location: Paul checks Barbara Kramer�s car registration midway into this episode. Her address is listed as 1416 No. La Brea. This is an inside joke. That address was not only the home of Perry Mason�s production company Paisano Productions from 1961 to 1966 but also where Raymond Burr often slept during the filming of episodes. It was originally Charlie Chaplin studios but is currently home to Jim Henson Productions. Submitted by Eric Cooper, 5 October 2010. Grandon Rhodes, who plays the trial judge here, was the judge in the first Mason episode TCOT Restless Redhead. Though he was in at the beginning and end of the series, Mr. Rhodes did not appear in any episodes in Seasons 2 or 5, and appeared only once in Seasons 3, 4 and 7. His Perry-Longevity is surpassed only by Kenneth MacDonald who appeared in all 9 seasons. + Ed Prentiss Judged 3 Perrys, played the "Man on Tape (Voice)"/a Dr. in 2 more & was in The FBI Story (1959) [IMDb]. Mike Bedard 3.12.15. Exactly like Leonid Kinsky in episode 264 (see trivia note there) Stewart Moss (Dan Swanson) was one of the original cast members of Hogan's Heroes where he played a P.O.W. named Olsen. After appearing in the 1965 pilot (the only B&W episode) he decided not to continue as a regular with the series although he made a few more appearances both as Olsen and other characters. Again, like Leonid Kinsky, had he continued with Hogan he might not have been available to appear in this episode of Perry Mason. 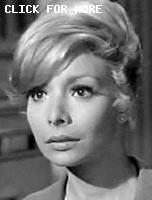 Like Moss, Arlene Martel would also make semi-regular appearances on Hogan playing Tiger, a French underground agent and also appeared as other characters. Submitted by Wiseguy70005, 6/23/12. Stewart Moss, Oliver McGowen and Arlene Martel would all make appearances on Star Trek within the next year and a half. Submitted by Wiseguy70005, 6/23/12. + as Science Lt. Joe Tormolen ("The Naked Time"), the Caretaker on the "Shore Leave" planet, & Mr. Spock's Bride-to-be T'Pring ("Amok Time"), respectively [IMDb]. Mike Bedard 3.12.15. + Also, Anthony Jochim had already appeared in the original Star Trek pilot in 1964. Parts of the episode were edited into a 1966 episode. The uncut pilot was not broadcast until 1988. Submitted by Wiseguy70005, 3/13/18. The attractive Indus Arthur, who played Barbara Kramer in this episode, was a professional harpist. She died in 1984 at the young age of 43 from skin cancer. Submitted by mesave31, 03/13/15. As I noted in episode #249, although there is only one episode title that refers to Perry, (for the reasons described above ) there are actually two that refer to characters Raymond Burr plays...this is the other. Clarified by Notcom, 060916. If you look close you can see where the scene is stitched together when Perry and Grimes are seen together in the courtroom. Look halfway between the two characters. You can see the background is out of focus and misaligned. Submitted by Kilo 2/12/2018. RB does a great Cockney accent. Thankfully, it wasn't another accent from Transylvania as we've seen from foreign characters in past episodes! Kilo 11/16/2018. This show seems to emphasize Raymond Burr's weight more than any other. The suits tend to hide some of it but the Grimes characters costumes seem to emphasize it along with his double chin. Submitted by Perry Baby 2/5/2017. Boy this is one time when both Della and Paul are REALLY pissed at one of Perry's clients (Jess Parkinson). Submitted by HamBurger, 07/08/2017.